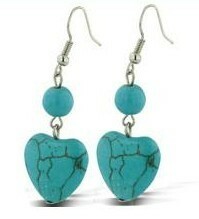 This week at SuperJeweler, you can get a beautiful pair of turquoise heart dangle earrings for only $5 with free shipping. These regularly cost $30! These earrings are 2 inches long and add a bright splash of color to any ensemble. They have a perfect review rating with 48 out of 48 people saying they would recommend these earrings to a friend. You can see all reviews here. Click here to get a pair!